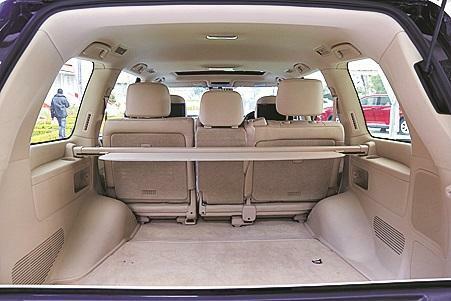 The massive width of the Lexus 450d diesel SUV is intimidating. As I climbed into its luxurious cabin, I could not take my eyes off the plethora of electronic buttons I was confronted with. The vehicle offers you a choice for every kind of drive you want to experience and terrain to tackle. Luxury is at its best with a combination of fine leather, rich wood trim, ornamentation and a deep piano-black finish. Silky white light LED lighting greets you once you are in with ambient illumination integrated into the doors. The perforated leather seats offer seamless comfort. 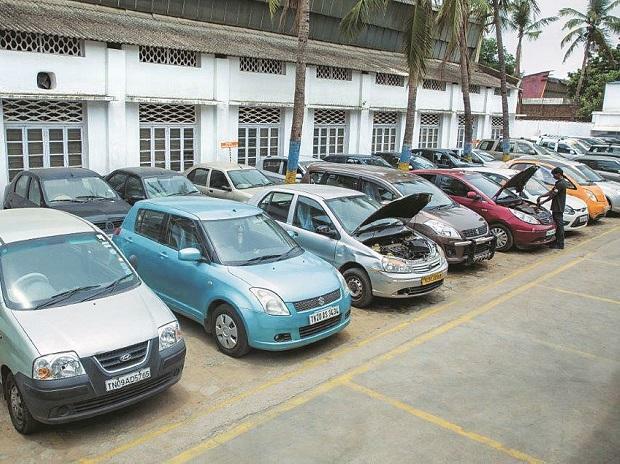 The car comes with a Climate Concierge that allows one to customise one’s own individual temperature and comfort. The Mark Levinson audio system with 19 speakers is at your service. In fact, the speakers are so effective that you can simply park the vehicle in the garden and the music from the car is good enough to entertain friends gathered around. 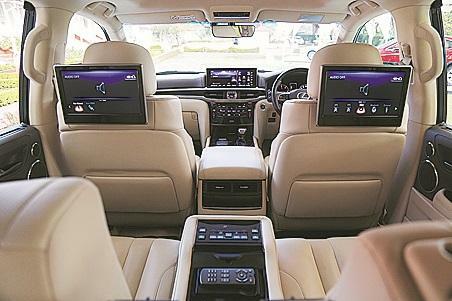 The rear seat comes with its own entertainment system and an independent 11.6-inch display screen. 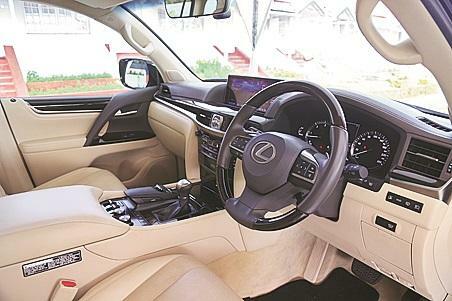 For the driver, there is the colour head-up display and the Lexus remote touch interface with multimedia coordination function. There is a 12.3-inch electro multi-vision display in the centre of the instrument panel and a 4.2-inch colour TFT multi-information display in the meters. Getting to know the electronic functions better, I began to drive and was determined to conquer the long, steep and twisting roads that lay ahead. Did this expensive four-wheel drive beast, the flagship of Lexus SUVs, have what it takes? With the centre console, one can toggle between drive modes that include Normal, Eco, Comfort, Sport S and Sport S+. Multi-terrain options include conditions like mud and sand, loose rock, mogul, rock and dirt or rock. For more tricky terrains that require smarter off-roading capabilities to tackle boulders and ruts, a five-speed crawl control function is available. This function is complemented by Turn Assist, which helps making lighter turns in limited space. Variable Flow Control is an advanced evolution of power steering that enhances steering precision at low speeds. Besides all this, there is also Active Height Control that adjusts the vehicle height automatically in various situations. For those who want more fun while driving, there are paddle shifts, too. I could gauge from my drive that the vehicle is rock-solid with a massive torque on demand, extremely stable on very uneven paths and has the added benefit of an insulated cabin. 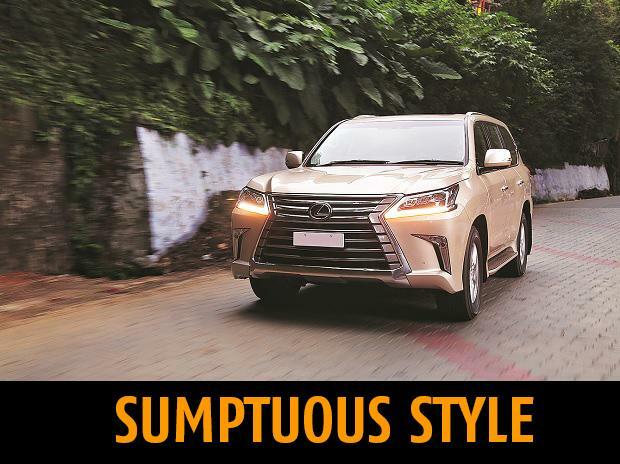 On the looks front, this huge SUV comes with signature Spindle grille, the L-shaped LED 3-eye projector-type headlamps and rear combination lamps. Not to miss are the LED daytime running lights, LED turn signals and LED front fog lamps. This vehicle has an electric tilt and a slide glass moon roof with sun shade. For the side steps, the Lexus LX 450d comes with LED illumination that shines from the bottom of the door mirrors. Smooth aluminum roof rails add to the butch looks of this beast. Surface emitting LEDs are set high on the back door. Easy to grip door handles come with sensors. With the electronic key in your pocket you can simply touch the door handle to lock it and a hand behind the door handle unlocks the vehicle automatically. The vehicle sits on 18-inch wheels and all five tyres (including the spare tyre) are of the same size. The Lexus LX 450d offers loads of space, comfort and luxury as it takes on every challenging terrain with considerable ease.